Physician and communal worker; born in Liverpool in 1828; died in London Nov. 28, 1893. After completing a brilliant academical career, he studied for the medical profession at University College Hospital, London, and continued his studies at Manchester. In 1850 he was elected a member of the Royal College of Surgeons of England; became a licentiate of the Royal College of Physicians of Edinburgh in 1859, and a member of the same in 1868. At first Dr. Behrend practised in Liverpool, where he was appointed honorary physician of the Liverpool Dispensary and other institutions. He also acted for some time as surgeon to a Lancashire regiment of militia. Later on he practised in London, where he was widely patronized. 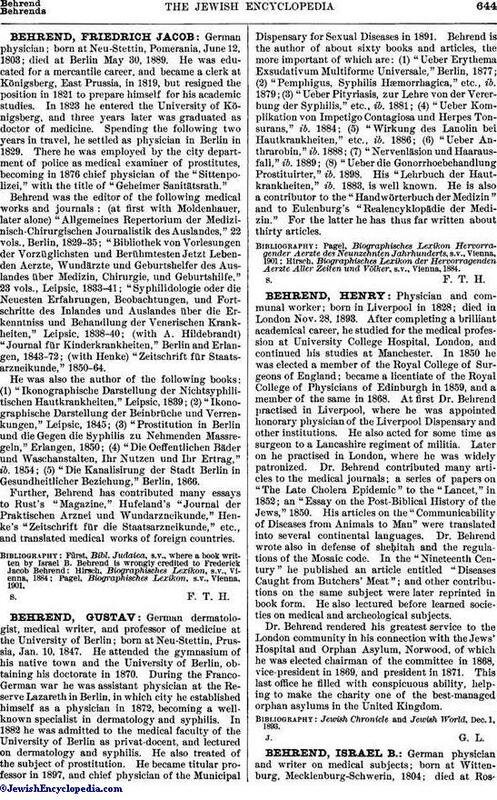 Dr. Behrend contributed many articles to the medical journals; a series of papers on "The Late Cholera Epidemic" to the "Lancet," in 1852; an "Essay on the Post-Biblical History of the Jews," 1850. His articles on the "Communicability of Diseases from Animals to Man" were translated into several continental languages. Dr. Behrend wrote also in defense of sheḥitah and the regulations of the Mosaic code. In the "Nineteenth Century" he published an article entitled "Diseases Caught from Butchers' Meat"; and other contributions on the same subject were later reprinted in book form. He also lectured before learned societies on medical and archeological subjects. Dr. Behrend rendered his greatest service to the London community in his connection with the Jews' Hospital and Orphan Asylum, Norwood, of which he was elected chairman of the committee in 1868, vice-president in 1869, and president in 1871. This last office he filled with conspicuous ability, helping to make the charity one of the best-managed orphan asylums in the United Kingdom. Jewish Chronicle and Jewish World, Dec. 1, 1893.